As a Journalist by day, and awesome cave dwelling Linux nerd by night, I take a lot of photographs with my Nikon D3300. That said, there are the obvious tools by Adobe that one can use, such as Photoshop, but there are some pretty awesome tools available for free to GNU/Linux users I thought I might share. With the three together, I’ve got basically everything I have needed. Every list that talks about GNU/Linux and photos / editing, will undoubtedly include GIMP. It’s a powerful alternative to Photoshop, that while lacking some features that users may be used to, it certainly qualifies as a full featured application. I won’t delve super deep into this one. 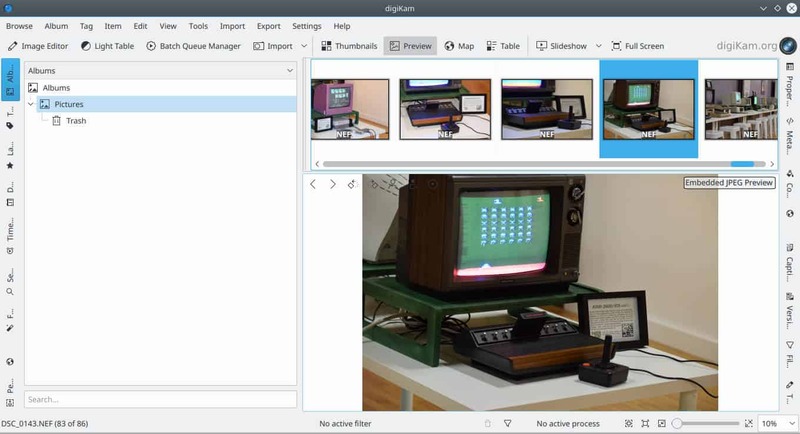 If you were only able to have one photography related tool on your machine at a time, you’d want to pick digiKam; it’s great as an organizer for your thousands of photos, but also has the ability to edit RAW images, allowing for fixing problems with things like exposure or white balancing. One of the things I love about digiKam is that I can quickly import files off an SD card into a new album (or existing) and then make very quick touch ups to exposure and shadows/highlights, before I save the file and open it in GIMP to make other modifications or fixes, if needed. Metadata, various image modification tools, clean interface and easy importing and managing of files makes digiKam absolutely great. Import photos, RAW files and videos. Auto-import operations such as rename or rotate. UFRaw is a small tool for editing RAW files. Yes, digiKam does this, and so does the mighty Darktable, but UFRaw has quickly started to become part of my arsenal due to its incredibly simple interface, and no frills features. It doesn’t do anything fancy besides make edits to RAW images, but it does it super easily and efficiently. I find it easier to make the touch ups I need, in UFRaw than I do in digiKam really. If you don’t like the idea of having to use a third program, you can simply stick to digiKam+GIMP and be fine, but if you’re like me, I don’t mind opening the third program if it means being able to do my work as simply or effectively as possible. UFRaw is great, and I highly recommend it. Now you: What tools do you use, for photography (not digital art), let us know in the comments! Have you tried Polarr? It’s pretty nice too. What about Darktable or RawTherapee? RAW processing doesn’t get better on Linux than these two. if you like tinkering w/ raws you’ve forgotten a gem i.e. darktable. Not forgotten. It’s mentioned in this article, however, I purposely chose to leave Darktable to a separate article all on its own, due to its numerous features. Pixeluvo, which is available for Linux and Windows, is a better Photoshop alternative than Gimp. It isn’t free, but the cost is low and it doesn’t have Gimp’s appallingly clunky, illogical way of working. It also has a sane interface, unlike Gimp. I’ve used Gimp a lot and while it has some good points it is not a Photoshop alternative. 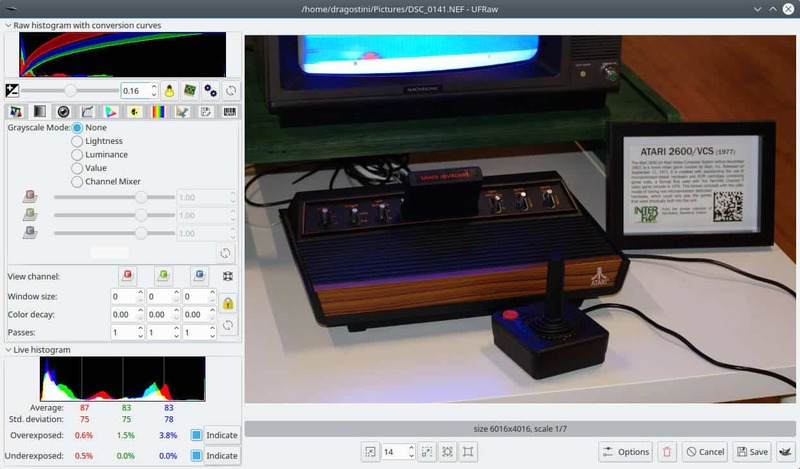 There is a fairly straightforward way to use Photoshop on Linux using PlayOnLinux. I used it and Photoshop worked fine, though not as well as on Windows. If you’re serious about photo editing there really is no Linux alternative to Photoshop and dual boot is the best option. I’ve used Linux and Photoshop on Windows since 2001, so my comment is based on practical experience. I’d drop Windows immediately if there really was a genuine alternative to Photoshop for Linux, either free or paid for. But there isn’t. I prefer (the latest) gThumb over DigiKam, but it’s a great app nonetheless. Hmm, I’d not heard of gThumb. I want to use DigiKam, as it appears to do everything I need done with image organization, but I can’t — it crashes when dealing with huge image libraries. I’ll give gThumb a try. Darktable is an awesome non-destructive RAW image editor and catalogue that deserves a wider audience. It’s FOSS and available for most platforms. It is incredibly powerful and is capable of way more sophisticated editing than Lightroom. Unfortunately, it isn’t the easiest of programs to learn or use but it is being actively developed. If you have the patience to learn, it’s well worth it. Just doesnt quite roll off the fingertips eh? You should check out https://pixls.us. It’s an article-list/blog/discussion site all about open source photography. For an example of professional grade editing with open source tools, for example, go directly to https://pixls.us/articles/skin-retouching-with-wavelet-decompose (by the site’s curator Pat David). GIMP and Krita work nicely for us Windows 10 users too…. Although it has a cost, Corel’s Aftershot Pro has finally sorted out a lot of the stupid problems it had in 2016/2017 and is now finally very good. In particular it can rescue details from areas that anything else would show as blown – I’ve tested this alongside all the RAW tools available in Linux and it just works where others fail. Lightzone is another venerable tool which is still going strong. Shotwell has some good simple tools for normal jpg work. Bizarrely my go-to app is FastStone which I run under Wine/POL. Needs a bit of fiddling (winetricks comctl32) to get thumbnails to display in large numbers, but other than that it does the job really well. Agreed digikam is just so unstable – it’s good but crashes too often to trust – YMMV. I can’t live without Gimp, UFRaw and gThumb.